The recent change in weather has got us all thinking about the need to update our wardrobes with more transitional pieces as we head towards AW18. 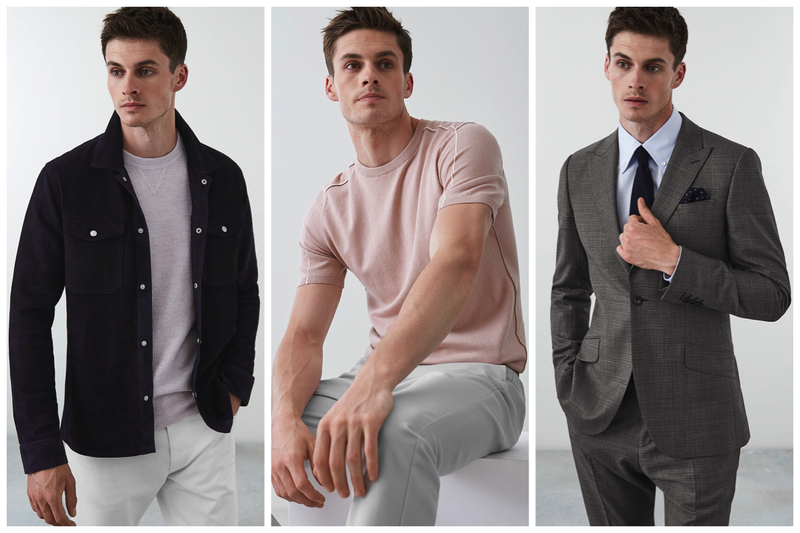 And when it comes to an instant refresh, the Men’s New Arrivals at Reiss, the fashion label we can always rely on to point is in the right direction, show that they really have thought of everything that is needed for the upcoming season. New in at Reiss for him we found casual essentials such as cotton chinos, jersey joggers and sweatshirts, as well as pieces for layering such as lightweight sweaters and overskirts, cable knits, a trend which will appear across men’s and women’s fashion going into the new season, modern fit suits and tailoring, geometric patterned shirts and checked trousers, and 100% pure wool and suede outerwear, as you would expect from Reiss who always deliver on quality materials and investment pieces. The perfect pair of casual trousers, whether you are going for a relaxed look or something a little smarter. 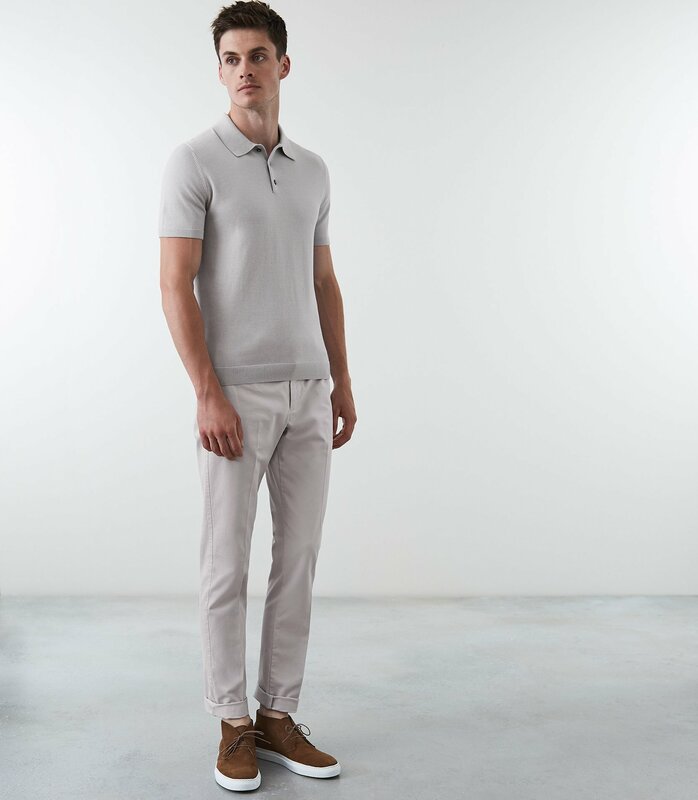 These slim fit chinos made from a stretch cotton are comfortable and stylish. Pair with a cotton shirt or polo, and your favourite sneakers or chukka boots. 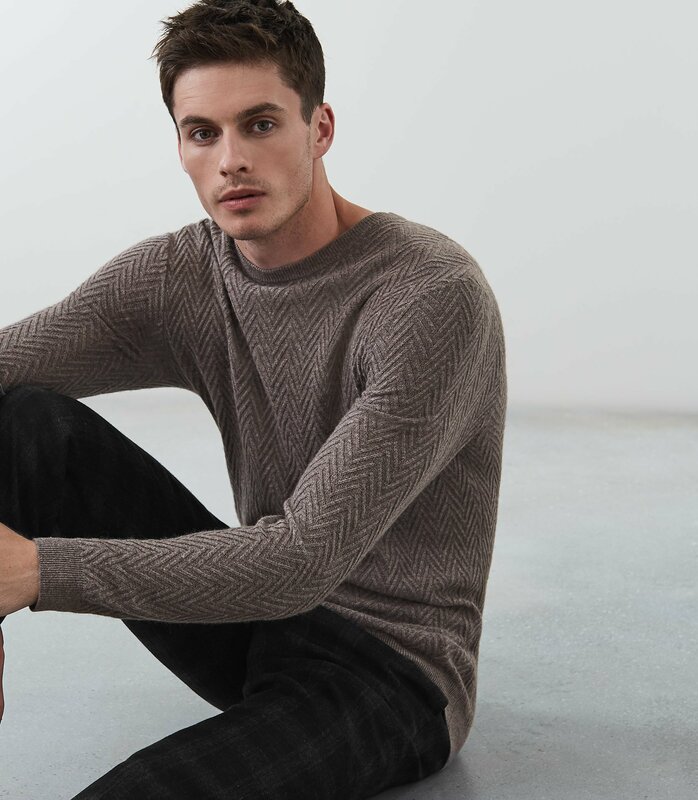 The Avons Chevron Cable Knit Jumper is perfect for layering as the weather cools, wear on its on with casual trousers or jeans, or style underneath a blazer. Made from a wool mix including alpaca, for a super soft and comfortable fit, that is also highly durable. 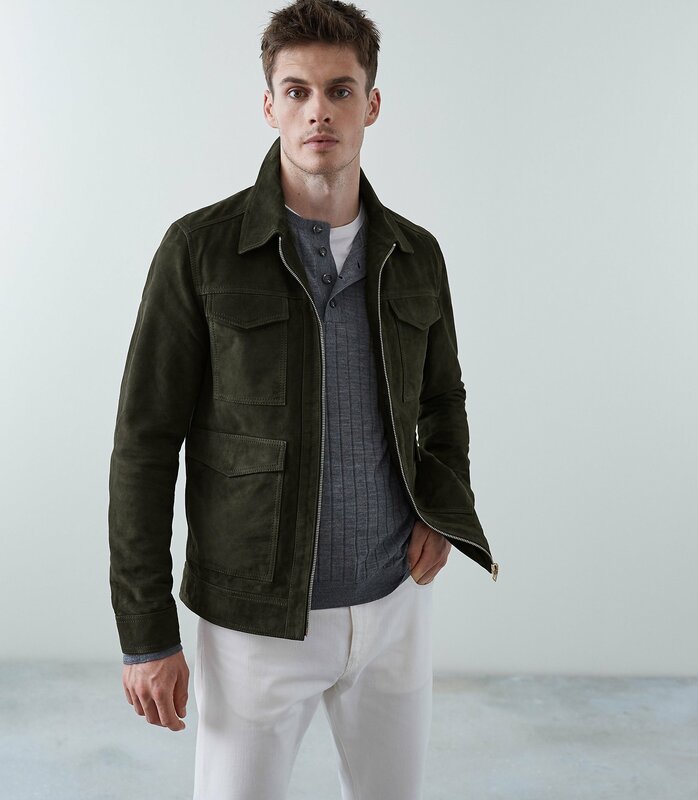 Made from 100% suede, this luxurious fully lined jacket features a unique four pocket design with a zip-up front, brushed silver button cuffs, and pointed collar. A jacket you will get so much wear out of, if there is one piece you invest in this season, make it this. 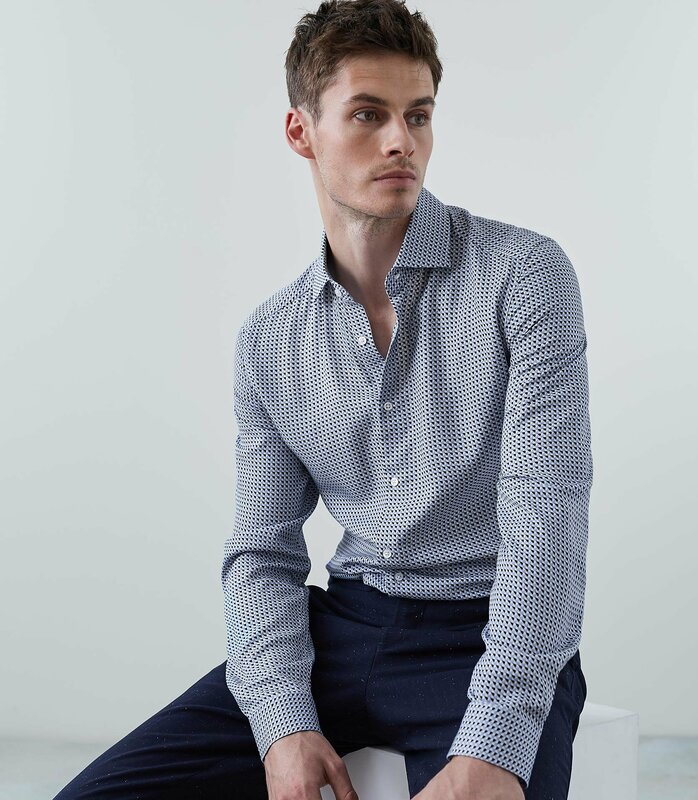 The Orlando Shirt from Reiss features an eye-catching geometric pattern made up of dots of different shades of blue. The classic collar, long sleeves and slim fit will make this one of your go-to-shirts, whether you are getting ready for a busy day at work or something much more exciting! Pair with slim fit trousers and brogues, or jeans and chelsea boots. 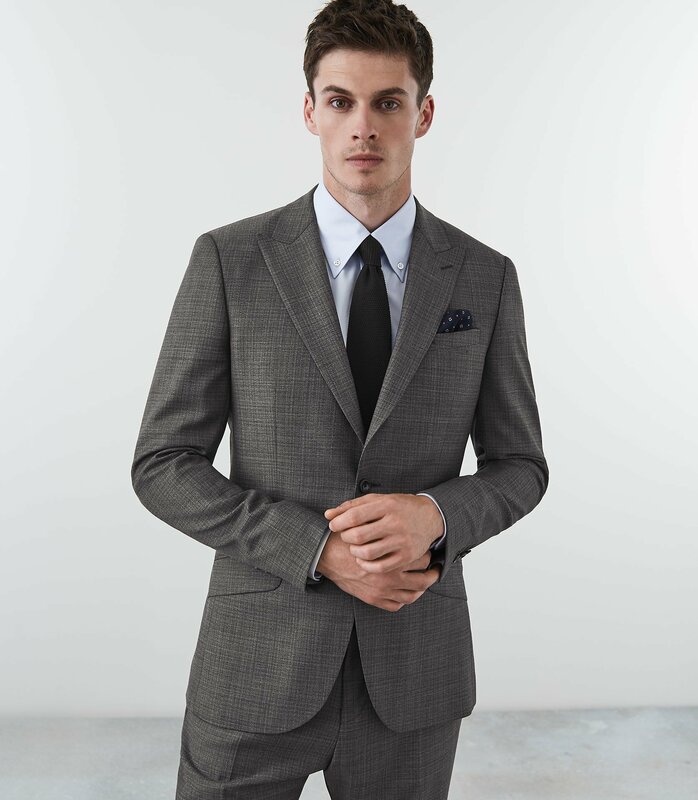 A wardrobe staple on standby for almost any important event, whether you are planning on kicking it in the boardroom, securing that new job you’ve always wanted or acting as a plus one at a wedding, this really is the suit for any occasion. 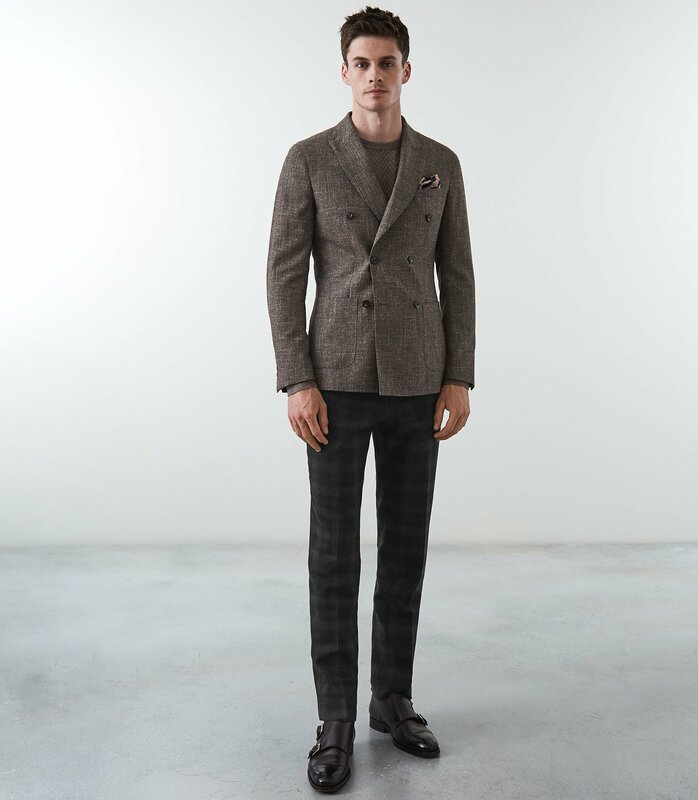 The seriously smart Norman Two-Piece Suit from Reiss is made from 100% pure wool and features a stylish modern fit. 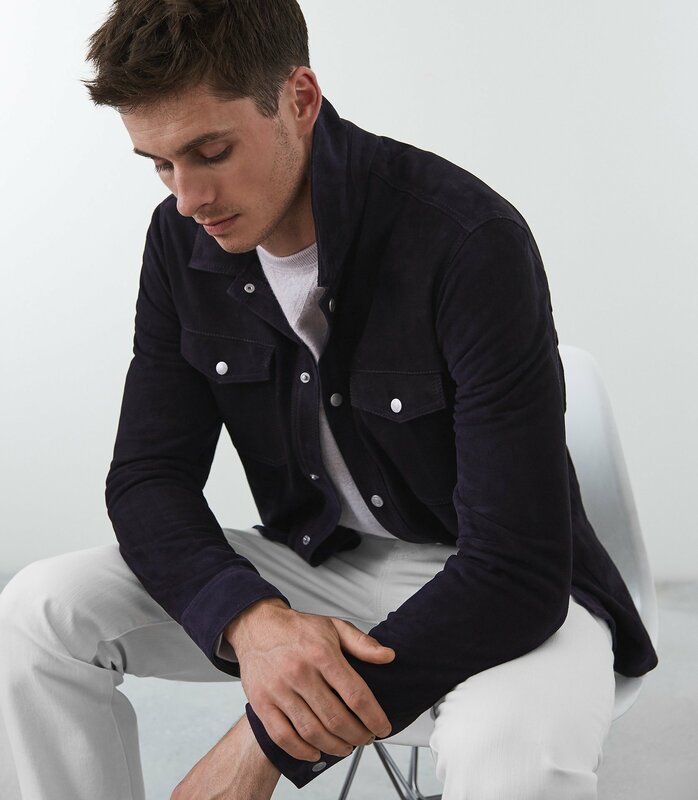 Available in navy, dark brown or grey, the casual Mick Overshirt is made from 100% suede for soft and comfortable wear. The relaxed fit makes it perfect for layering over T-Shirts or lightweight sweaters. A great alternative to a jacket or coat as the weather starts to cool. Style with slim fit trousers and boots, or with jeans and sneakers. This is sure to become a key piece in your new season wardrobe you’ll come back to again and again. Whether you are looking for some smart new weekend attire or everyday work pieces that are anything but boring, the Trekker Trousers from Reiss with their distinctive navy check pattern offer a stylish alternative to plain old tailored trousers. Wear with a contrasting lightweight sweater and structured blazer, or a white shirt and oxford shoes. 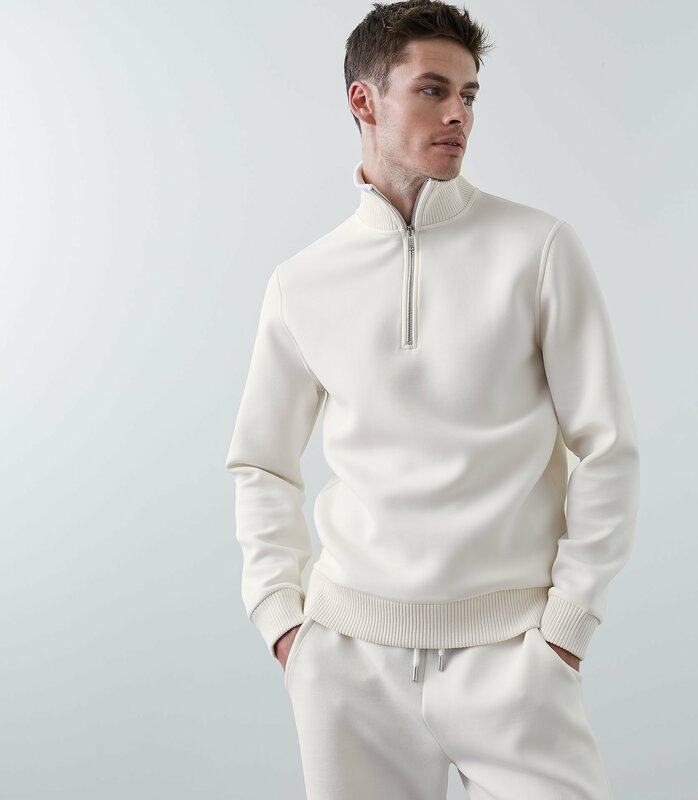 This half zip jumper with funnel neck and ribbed waistband and cuff detailing, is made from a super soft jersey fabric, making it the perfect piece for lounging around in on days off, or for a more laid-back look for days out. For ultimate comfort, pair with the matching jersey joggers and your favourite sneakers to fully embrace that on-trend athleisure look. 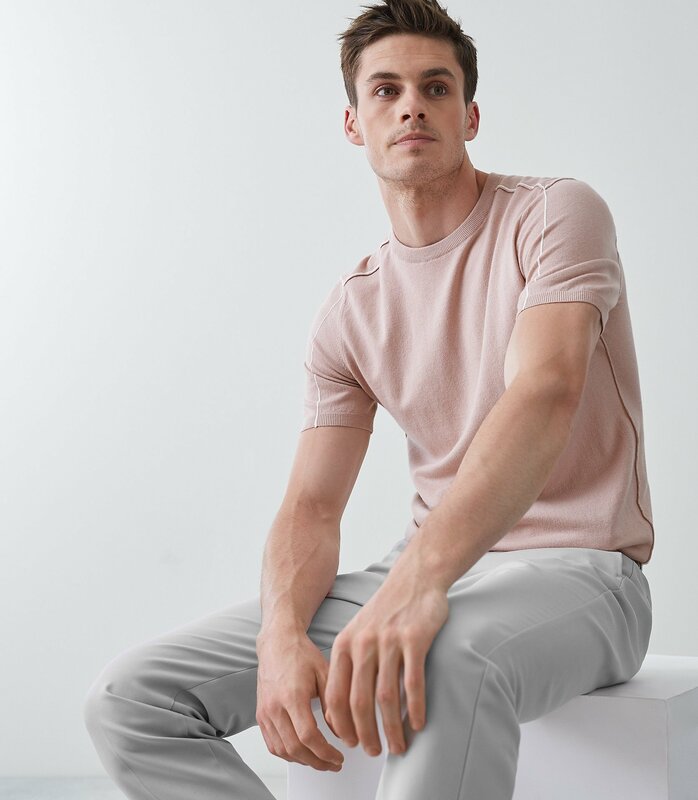 A stylish new take on the traditional tee, the Leven short sleeved top is made from a soft cotton-wool mix and features a classic crew neckline and distinctive inside out seam detailing. Available in two delicious pastel shades of soft pink (as pictured) or soft blue. Wear yours with a pair slim fit cotton trousers and leather boots, or jeans and sneakers. 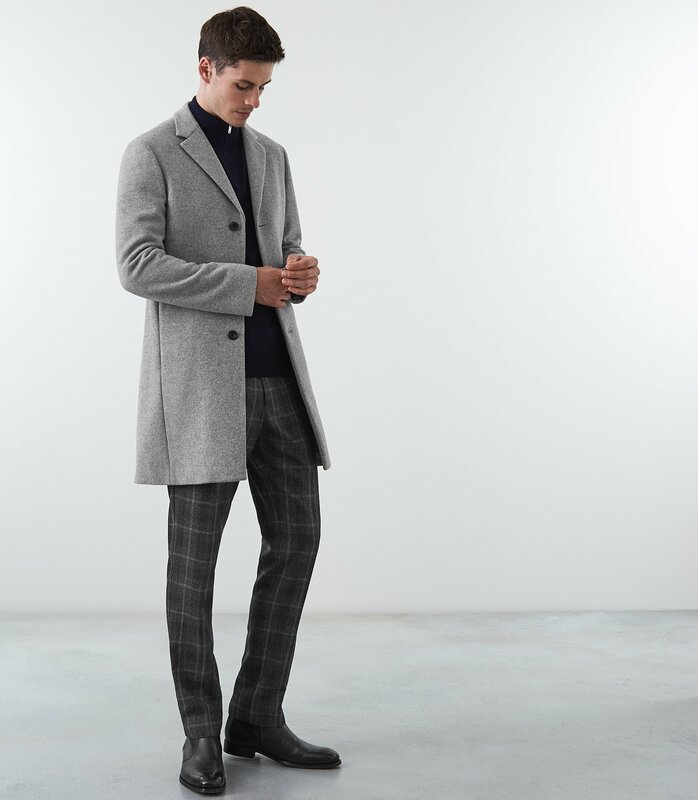 And finally, the Gable Overcoat from Reiss, fully lined and made from 100% pure wool, this will become your love forever coat that will instantly smarten up any outfit, as required. Available in a choice of colours, soft grey (as pictured), camel or navy, this stylish overcoat looks just as fabulous worn over a sweater and chinos as it does over a sharp tailored suit.